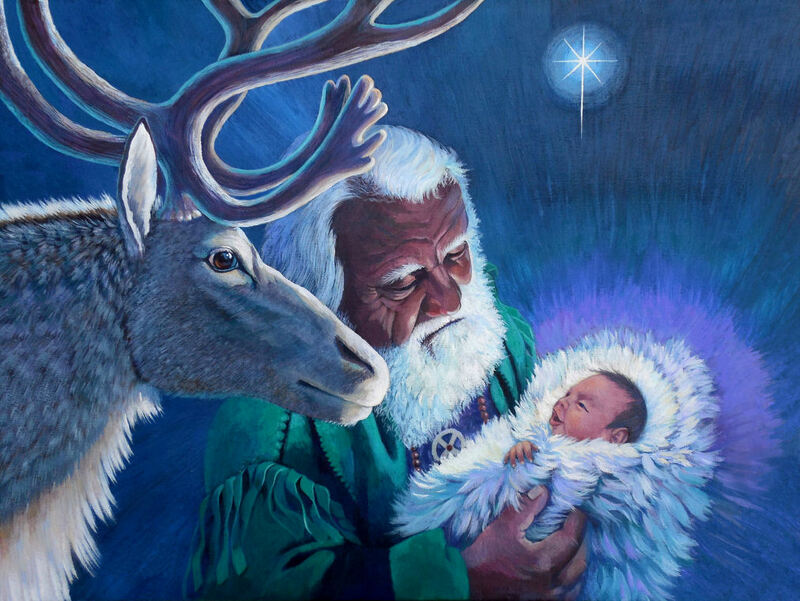 Limited Edition of 95 signed and numbered - Giclee on canvas 8 x 10 inches The painting shows a combination of the Santa story including the reindeer as they admire Jesus, the reason for the season. The Star of Bethlehem shows the way. Nicholas, who was born during the third century in a small village at the South end of Turkey, was raised to be a devout Christian. Nicholas was a young boy when his wealthy parents, died in an epidemic. He sold his inheritance and gave his money and possessions to the poor. He dedicated his life to the service of God. As a young man he became Bishop and was known for his generosity and love of children. Santa embodies the Spirit of Giving. St Nicholas was a devout Christian. Jesus was God’s gift to mankind and Santa’s First Gift. Limited Edition of 95 signed and numbered - Giclee on canvas 18 x 24 inches Only 4 left Sell out of this print is close.